Today, we're highlighting a Segue Series duo reading by Ange Mlinko and Andrew Epstein, recorded March 3, 2000 at Double Happiness. After a lavish introduction, Mlinko begins with a pair of poems — "Là" and "Marrakech Rilke" — inspired by her recent stint living in Morocco. Her set also includes "Generous Estimates," "Like Rappers Dying," "Postcard from Up to Down," "Mismatch," "Poem," "I'm Putting on My Coat," "Survivor Species" and "Personae," among others. On Mlinko's PennSound author page, you'll also find her segmented 2001 reading as part of the Line Reading Series, along with "Poem Bejeweled with Proper Nouns" (from Frequency Audio Journal) and her contribution to the 1998 Bernadette Mayer celebration at the Kelly Writers House. Mlinko's co-reader that evening was Andrew Epstein, poet and author of Beautiful Enemies: Friendship and Postwar American Poetry (an investigation of the fruitful relationships between, among others, Frank O'Hara, John Ashbery and Amiri Baraka). The poems included in his half-hour set include: "Skech: Roof of the Metropolitan," "Postures of Belief," "After Seeing Godot," "North Dakota is Everywhere," "Wicker Frame," "Vermont Fudge Center," "Art Forms" "Fugue #3 in C-Sharp," "Scrapple from the Apple," "Time and Her," and "Natural Election." You can listen to both of these readings by clicking on the individual links above, and be sure to visit our Segue Series at Double Happiness page for more than three dozen readings recorded between 1999 and 2001 at the now-defunct downtown bar. Poem Talk 14: Wallace Stevens' "Not Ideas About the Thing but the Thing Itself"
Today, we're launching the much-awaited fourteenth episode of the PoemTalk Podcast Series (a joint production of PennSound, the Kelly Writers House and the Poetry Foundation): a discussion of Wallace Stevens' iconic poem, "Not Ideas About the Thing but the Thing Itself." 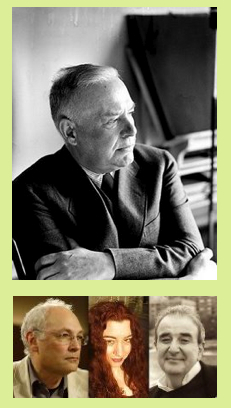 Joining host (and Stevens scholar) Al Filreis in New York City for this program are his PennSound co-director, Charles Bernstein, and two first-time PoemTalkers, Nada Gordon and Lawrence Joseph. The discussion begins with a brief exploration of the dichotomy of inside/outside that's present throughout the poem, as well as its inherent finality (it appears as the last poem in Stevens 1954 Collected Poems). Joseph identifies this as "the new knowledge of reality," coming almost as an answer to a poetic life "constantly dealing with this problem of reality and what reality was." Filreis also sees an uncharacteristic shift in the poet's ideology from a belief that "reality is the imagination," to the understanding that "the imagination is actually real." 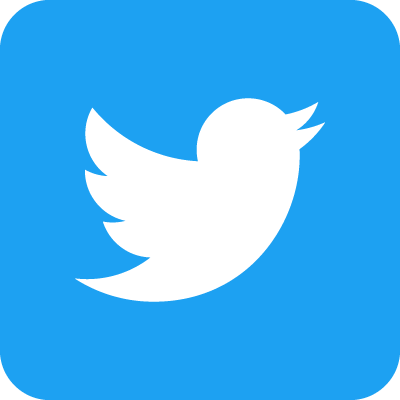 Gordon furthers this notion by stating that, to her, "the whole poem is protesting too much" — in a world of "chicken-glazed wheelbarrows," Stevens is pushing firmly towards real events — and it's that over-assertion that makes her doubt him. Filreis offers the possibility that his conclusion lies in the realization that "the meagerness of reality is real," though Gordon is only able to connect through the poem's more fantastic elements. Bernstein asks Filreis for a social/political/historical reading, as well as a biographical reading of the poem, and he opts to deliver only the latter, acknowledging that it enters into discourse with William Carlos Williams' famous dictum, "no ideas but in things," as "a final word" to his fellow Modernist — both a concession to Williams and a defiant restatement of his ideal. Filreis ventriloquizes and expands the poet's sentiment: "I'm an ideas guy to the end, but it's interesting how scrawny the imagination has become . . . I get to the end of the imagination, there's nothing left, but imagining that nothing left is itself a powerful gesture of the imagination." Likewise, a dynamic exists between the concrete reality of things and the ghostly abstraction of the philosophical conundrum at the heart of this work. The panelists then direct their attention to another one of the poem's thorniest and loveliest phrasings, "A chorister whose c preceded the choir," which Gordon reads as the tuning note which starts the choir's performance, and Bernstein interprets as the letter which precedes the word itself — a reminder of not only its constructedness, but also a disharmony which functions as "an attempt to think outside of dualism." Guided by this spirit, other associations are offered, including a nod to Stevens' early poem, "The Comedian as the Letter C," as well as as a pun on sight, a reduction of the poem's "scrawny cry" to its most basic sound, and an allusion to birdsong as a traditional metaphor for the poet's voice. The springtime theme also makes connections between C and creation for Gordon, though Bernstein conversely sees a non-conformist swan song. Finally, Gordon wraps up the conversation in grand fashion by sharing her Flarfist rewrite of the poem, "Not Ideas About the Bling But the Bling Itself." Please be sure to visit the PoemTalk blog for more information on this program, as well as the thirteen episodes which preceded it, and stay tuned for future episodes focusing on poems by Lyn Hejinian, Robert Creeley, Rodrigo Toscano, Lydia Davis, and more. You can also subscribe to the series through the iTunes music store, guaranteeing that new episodes will be delivered to you as soon as they're released. Today, we're proud to announce a new author page for noted South African poet, novelist and activist Breyten Breytenbach, anchored by a segmented recording of his December 4, 2008 reading at the Kelly Writers House as part of the Writers Without Borders series. Breytenbach is introduced by both Kelly Writers House director, Jessica Lowenthal, and UPenn professor (and scholar of South African and American literature) Rita Barnard, whose illuminating comments are delivered both in English and her native Afrikaans. After warm greetings to his hosts and audience, he begins with "Looking for the Road," from his most recent volume, A Veil of Footsteps (a piece, he acknowledges, he doesn't read often), and continues with a healthy mix of poems new and old, including "A Black City," "Letter to a Butcher from Abroad," "In a Burning Sea," "Transit," "Your Letter," "Goya" and "The Way Back," before sharing the short story, "All One Horse." The reading concludes in a solemn mood with "Prayer," which is followed by a lengthy question-and-answer session. 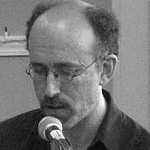 On Breytenbach's PennSound author page, you can also hear the author's hour-long appearance on Cross-Cultural Poetics, in which he reads poetry from Lady One: of Love and Other Poems, and discusses his work with host Leonard Schwartz. Since its launch last spring, the Writers Without Borders series has done an admirable job of living up to its mission: bringing writers, "whose voices — whether because of regional unrest, cultural turmoil, aesthetic misunderstanding, the difficulty of travel, problems of translation, etc. — have not been much heard" to UPenn and the greater Philadelphia writing community. Other readings from the series that are available on PennSound include Cecelia Vicuña's April 15th reading, and the September 23rd launch for New European Poets, featuring Wayne Miller, Adam Sorkin, Marella Morris-Feltrin, Murat Nemet-Nejat and J.C. Todd. In the near future, we'll also be adding this past week's reading by Zhimin Li, which Al Filreis mentioned on his blog today. Here's a pair of new readings by James Sherry, a highly-influential figure in contemporary poetics, both as the publisher of Roof Books and the founder of The Segue Foundation, as well as through his own inspired writing. Appropriately enough, we begin with a Segue Series reading, recorded December 13, 1986 at the Ear Inn, which consists of two longform poems "in an Asian mode." The first, from 1985's Popular Fiction, is "Made in China," which Sherry describes as "a combination of suburban reminiscences and Chinese aesthetic theory." This is followed by an untitled excerpt from Our Nuclear Herigate (Sun and Moon, 1991), which is based on a Chinese prose poetry form called "fu." It's one of a half dozen Segue Series readings recorded over the past three decades which is available on Sherry's PennSound author page. We also have a February 19, 1992 reading, recorded as part of the Wednesdays @ 4 Plus Series at SUNY Buffalo. In this reading, Sherry samples freely from throughout his writing career, both for the benefit of a student audience which might not be familiar with his work, and because, he tells us, "I like hearing what the old work sounds like next to the new." He starts with two poems from 1978's Part Songs ("A Drawing on Strauss" and "When She Comes"), then moves on to two excerpts from 1981's In Case, and two pieces from Popular Fiction ("Epistle Apology" and "The Edge of Posession"). The second half of the reading is dedicated to selections from Our Nuclear Family, including "Plain and Fencing Rhetoric," "Free Radicals," "Accidentals," "Live Action Language," and parts one and two of "Empire of Rats." Click on the title above to listen to both of these recordings, and many, many more on Sherry's PennSound author page, and keep an eye out for more offerings from the Wednesdays @ 4 Plus series at SUNY Buffalo in the near future. 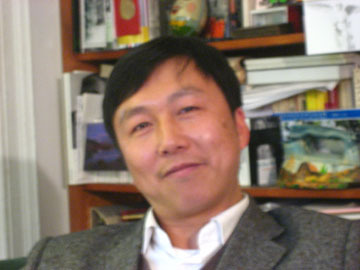 Today, we're very proud to present a new author page for Chinese poet, Zhimin Li, which showcases recordings from his visit to the Kelly Writers House last Wednesday, as part of the Writers Without Borders series. The evening begins with introductions by Kelly Writers House director Jessica Lowenthal and Charles Bernstein, who notes that this is the first public event organized by the Chinese/American Association for Poetry and Poetics — an international organization whose US home is UPenn's Center for Programs in Contemporary Writing, and on whose board both Li and Bernstein serve. This is followed by a reading, in which Li's poetry is presented in both Chinese and English. After a brief intermission for refreshments, Li returns to the podium to deliver a forty-five minute lecture, titled "New Chinese Poetry: the Origin and the Development from the Perspective of Cultural Exchanges Between China and the West." We're also proud to announce a new page for the Writers Without Borders series, where you can hear this reading, along with previous events featuring Breyten Breytenbach and Cecelia Vicuña, along with last fall's launch event for the anthology New European Poets. We've just added four new episodes of the much-beloved poetry series, Cross-Cultural Poetics, which is produced in Olympia, Washington at The Evergreen State College's KAOS-FM, and hosted by poet and scholar, Leonard Schwartz. Episode #175, "Unboundaries" features Michael Palmer, who reads from and discuses his latest collection, Active Boundaries: Selected Essays And Talks, and Nathalie Stephens who shares excerpts from her latest, The Sorrow And The Fast Of It. Episode #177, "What Narrative," also features a pair of authors talking about their latest collections: this time, the poets Maxine Chernoff and Bill Ransom. This is followed by episode #178, "Four Editors," in which the heads of four presses — Stephen Motika (Nightboat Books), Edwin Frank (New York Review of Books Classics), Susan Schultz (Tinfish Editions) and Edward Foster (Talisman House) — chat with Schwartz about their editorial ideologies as well as their latest offerings and forthcoming books. Finally, Foster returns for episode #179, "To Listen," to share from his latest collection, History of the Common Scale. Composer Alice Shields, who also appeared on episode #174, discussing her opera, Criseyde, makes another visit to talk about her new piece, Kyrielle. Next week, we'll launch an additional four new episodes, but for now, be sure to visit PennSound's Cross-Cultural Poetics homepage, where you can listen to six years' worth of episodes from this innovative program, which showcases some of the most influential international voices in contemporary poetics. This Tuesday, Philadelphia's poetry community will gather at the Kelly Writers House to celebrate a tremendous achievement by one of our own: the publication of Ron Silliman's The Alphabet. Begun in 1979 and completed in 2004, Silliman's ambitious epic — in the words of the Times Literary Supplement — "mingles quotidian observation, linguistic-philosophical reflection, and street-level social critique to produce as vivid, systemic, and cumulatively moving an account of contemporary life as any poet now writing." The reading will be introduced by long-time friends and compatriots, Charles Bernstein and Bob Perelman, and another close friend, Rachel Blau DuPlessis, has recorded a ten-minute audio essay on The Alphabet, which is now available on both our Silliman and DuPlessis author pages. We hope you'll join us this Tuesday evening at 6:30 PM in the Arts Cafe for this very special event. More information is available both on the Kelly Writers House website and Silliman's Blog, and be sure to visit Silliman's PennSound author page, where you can hear many readings from The Alphabet — in particular, the "Albany," "Quindecagon," "VOG" and "You" sections. As promised in Friday's PennSound Daily entry, here are the four latest episodes of the influential poetry program, Cross-Cultural Poetics, hosted by Leonard Schwartz. We begin with episode #180, titled "Dura/Dementia," in honor of the works from which its two guests read: Myung Mi Kim's recently-reissued Dura (originally published by Sun and Moon in 1999), and Susan Schultz's Dementia Blog (Singing Horse Press, 2008). For episode #181, "Hearth and Threshhold," Nathalie Stephens — who most recently appeared in episode #175 discussing her poetry collection, The Sorrow and the Fast of It — returns to chat with Schwartz about a new book of essays, At Alberta, and she's joined by English-born, New York School poet Simon Pettet, who shares selections from his collected poems, Hearth. These newest programs remind us of both the incredibly broad scope of Cross-Cultural Poetics, as well as the luxury of its one-hour run-time, giving Schwartz and his guests plenty of time to delve deeply into the works under discussion. Please be sure to visit PennSound's Cross-Cultural Poetics homepage, where you can listen to the program's entire run, starting in October, 2003. 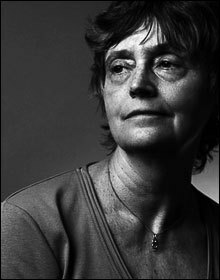 We'd like to close out the week by highlighting our archive of recordings by Alice Notley, who, for nearly forty years, has not only radically redefined the possibilities of women's poetics, but poetics in general, inspiring generations of poets to follow in her footsteps. We begin with the poet's December 1971 reading in Bolinas, CA, which she identifies as "perhaps my third poetry reading ever" — a recording that comes to us from Robert Creeley's collection of reel-to-reel tapes. Notley starts with "Conversation," a collaboration with her husband, Ted Berrigan (which also appeared in his 1975 collection, Red Wagon) and continues with a number of early poems from Phoebe Light and Love Poems, before concluding with eleven sonnets from her 1971 debut, 165 Meeting House Lane. Next, we have a 1987 reading at SUNY Buffalo, which draws heavily from Notley's mid-80s collections, Margaret and Dusty, At Night the States and Parts of a Wedding. Highlights include "Homage to Marianne Moore," "I the People" and "In Ancient December," as well as her breathtaking performance of the then-unpublished "At Night the States." Our final full reading is, appropriately enough, Notley's November 2006 reading at the Kelly Writers House — an event that celebrates the two collections published that year, Grave of Light: New and Selected Poems 1970-2005 and Alma, or the Dead Women — which is presented in both audio and video formats. From the latter, she reads the trio of "Answer If You Can," "Ballad" and "Pollen," and these are preceded by a handful of classic poems such as "Jack Would Speak Through the Imperfect Medium of Alice" and "Ten Best Issues of Comic Books," as well as selections from later collections including Disobedience ("Help Me Corpus Sagrada," "Enuma Elish") and The Descent of Alette. She concludes the reading with a half-dozen pieces from the previously-unpublished sequence "Songs and Stories of the Ghouls," and a lenghty excerpt from her most recent collection, In the Pines. In addition to those readings, we have a trio of additional recordings, including a 2004 appearance on Cross-Cultural Poetics focusing on The Descent of Alette; a 1979 reading of "A Woman Comes Into the Room," taken from The World Record: Readings at the St. Mark's Poetry Project, 1969-1980, and finally, a marvelous performance of Mysteries of Small Houses' "C. '81," taken from Frequency Audio Journal. Click on the title above to start listening. 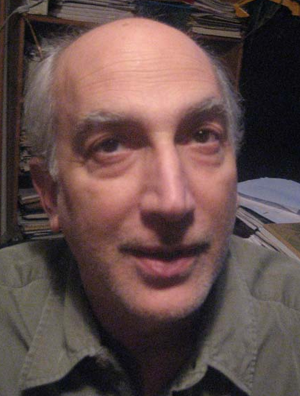 PennSound Contributing Editor Danny Snelson has been working on stereo remasters of a number of pieces from Charles Bernstein's 1982 Widemouth Tapes release, Class, which consists of some of the earliest recordings of the poet from 1969 and 1976. Today, we're happy to announce that three tracks — "My/My/My," "Class" and "Goodnight" — are now available for listening and download. All three pieces feature multitrack tape manipulations, with Bernstein utilizing both reel-to-reel and cassette players to create dialogic collages of pop culture quotations, and dense matrices of looped speech. "My/My/My" has its origins in a July 1974 poem, which first appeared in Bernstein's debut collection, Asylums, preceded by an epigraph from Swami Satchidananda: "Count these number of things you call mine. This is the distance from you to enlightenment." Realized here in three overlapping tracks, the poem's already-intense litany effect — "my pillow / my shirt / my house / my supper / my tooth / my money / my kite / my job" — is amplified exponentially, challenging listeners to parse through and follow multiple language lines, which often contradict or distract from one another. "Goodnight," which features vocal contributions from Susan Bee, further rarifies this approach, creating a lovely microcosmic meditation on the single word, "goodnight." Rendered in warm and friendly tones, and layered to create a gentle and near-constant din, this piece privileges sound and syntax equally. Both "My/My/My" and "Goodnight" betray the influence of composer Steve Reich's "phase shifting" technique (most notably implemented on early pieces such as Come Out and It's Gonna Rain), in which subtle variations caused when multiple voicings of a single line gradually slip out of sync with one another, produce surprising juxtapositions and timbres. Presented here with spacious stereo separation, the various tracks that comprise each piece are given proper room to breathe, and seem more distinct. The final recording, "Class," employs a different technique, creating a monophonic collage of samples from well-known films, including Marlon Brando's Oscar-winning performance in Elia Kazan's On the Waterfront, a brief snippet of Casablanca's "As Time Goes By," and two songs from the Depression-era musical Stand Up and Cheer ("Baby Take a Bow" and "I'm Laughing"), which are juxtaposed with fragments of live ambient speech. Bernstein's primary editing tool is his cassette player's rewind button, used to create abrupt and unambiguously mechanical jumps, splices and repetitions The piece's focal point is a stunning and stuttering deconstruction of Brando's "I coulda had class . . . I coulda been a contender" soliloquy, in which his famous lines are allowed to play through completely once, before being scrambled in an increasingly claustrophobic series of cuts, each of which is accompanied by a thumping punch-in noise that hits us as hard as the fists which bring the once-promising boxer Terry Malloy's career to a devastating end. 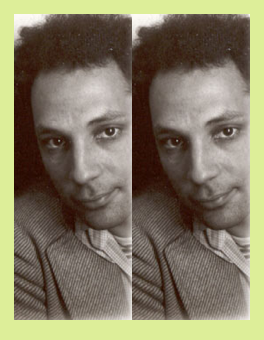 Click on the title above to listen to all three remastered tracks, as well as the pieces "Piffle" and "1-100," which will be remastered in the near future, and be sure to visit PennSound's Charles Bernstein author page for forty years' worth of recordings from this influential poet. Last week, we invited you to join us at the Kelly Writers House, for a celebration of Ron Silliman's recently-published collection, The Alphabet, and hopefully, you were able to come out for a great reading, not to mention good company, good cheer and good food (a menu chosen from items mentioned in the book). For those not fortunate to be in Philadelphia for the event, we're very happy to announce that Silliman's reading is now available, in both audio and video formats. As is appropriate for the occasion, Silliman's own performance is preceded by a quartet of introductions by (in order), Jessica Lowenthal, Rachel Blau DuPlessis (whose recorded essay on The Alphabet we mentioned last week), Charles Bernstein and Bob Perelman, who speak to Silliman's importance within the local poetry community and the book's long-simmering composition, as well as sharing anecdotes from their long friendships with the poet. The reading itself begins with "Albany," the first of twenty-six alphabetical chapters, and also one of the earliest poems written for the collection, dating from 1979. This is followed by the poem which started his Alphabet project, "Force" (also from 1979), which is dedicated to Perelman. 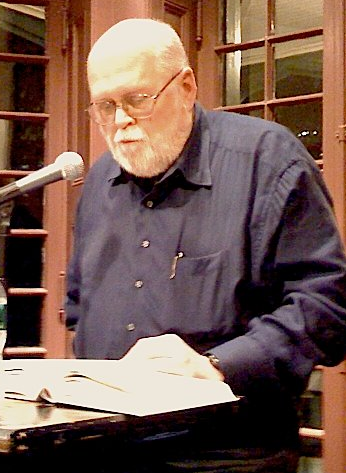 In "Force," Silliman sees "a movement back and forth between lines and prose here" — "there are more syntactic shifts going on of meaning in the prose and more argumentation going on when I'm reading in the lines," a dynamic emblematic of the poet's belief in the aesthetic, "left brain poetry, right brain prose." Silliman continues with "Non" and several excerpts from "Paradise" before concluding with a section of "VOG" dedicated to Larry Eigner. On Silliman's PennSound author page, you can listen to dozens of recordings, including readings, interviews, lectures, conversations and collaborations, starting with a 1978 reading at the legendary San Francisco venue, the Grand Piano. To listen to this most recent reading, or to watch a streaming video recording via KWH-TV, click on the title above. 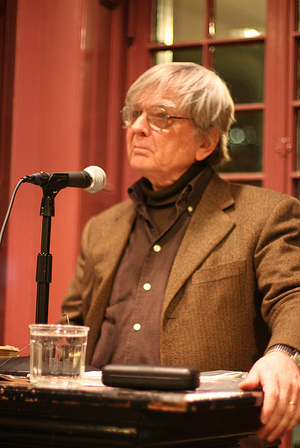 Without a doubt, the most exciting of the many events at the Kelly Writers House this week was Robert Coover's visit as the first of this year's three Kelly Writers House Fellows. The esteemed postmodernist and hypertext pioneer joined us for a daylong interactive session with UPenn students, and two events open to the public (and, via KWH-TV, anyone with an internet connection): a reading Monday evening, and a Tuesday morning Q&A session with Writers House head and PennSound co-director, Al Filreis. We've created a new PennSound author page where you can hear recordings of both of these wonderful events. While fiction writers aren't often showcased on our site, Filreis explains why Coover's lyric prose demands inclusion in a blog post earlier this week: "The reading Bob gave last night was riveting. He read all languagy stuff — prose-poems, really. Antic, thick with sound, featuring some of his many imitative American voices." In particular, he singles out "The Fallguy's Faith" (from his recent collection A Child Again), a "brilliant 1.5-page piece about Humpty Dumpty, which reads like a gone-awry thesaurus of American idioms around falling and fallen." Monday night's reading is bookended by a pair of new writings — a new short story, titled, "The New Thing," and an excerpt from Coover's forthcoming novel, Noir. In-between, the author shares work from throughout his career, including excerpts from The Public Burning and Pinnochio in Venice, as well as the story, "The Grand Hotel Nymph Light," from The Grand Hotels (of Joseph Cornell) and another brief piece written in anticipation of the oft-asked question, "why do you write?" We've also broken out a trio of brief readings interspersed throughout Tuesday's Q&A session, including the aforementioned "The Fallguy's Faith," the opening paragraphs of "Grandmother's Nose" (also from A Child Again) and Coover's vivid description of Charlie Chaplin, from "Charlie and the House of Rue," from A Night at the Movies. Be sure to listen to the entire conversation, however, for a lively and engaging discussion of some of Coover's best-known works, including The Public Burning and Pricksongs and Descants: Fictions, as well as a consideration of the future of electronic writing and its relation to contemporary film. You'll also find links to streaming videos of both events. For more information on this year's two remaining Writers House Fellows — Joan Didion and Mary Gordon — as well as information on how you can attend their events (unfortunately, the Didion reading and discussion have already been booked-up), or watch live through KWH-TV, please be sure to visit the Kelly Writers House Fellows homepage.